DESCRIPTION - Antique Blue Round Satin Cord, 1.5mm x 76 meters / 83.11 yards. 100% Polyester. DESCRIPTION - Apple Green Round Satin Cord,1.5mm x 76 Meters / 83.11 Yards. 100% Polyester. DESCRIPTION - Aqua Round Satin Cord, 1.5mm x 76 meters / 83.11 yards. 100% Polyester. DESCRIPTION –9935 Baby Maize - Round Satin Cord, 1/16 x 50 Yards. 100% Polyester. DESCRIPTION - Black Round Satin Cord, 1.5mm x 76 meters / 83.11 yards. 100% Polyester. DESCRIPTION - Brilliant Blue Round Satin Cord, 1.5mm x 76 meters / 83.11 yards. 100% Polyester. DESCRIPTION - Brown Round Satin Cord, 1.5mm x 76 meters / 83.11 yards. 100% Polyester. DESCRIPTION - Cranberry Round Satin Cord, 1.5mm x 76 meters / 83.11 yards. 100% Polyester. DESCRIPTION –9935 Emerald - Round Satin Cord, 1/16 x 50 Yards. 100% Polyester. 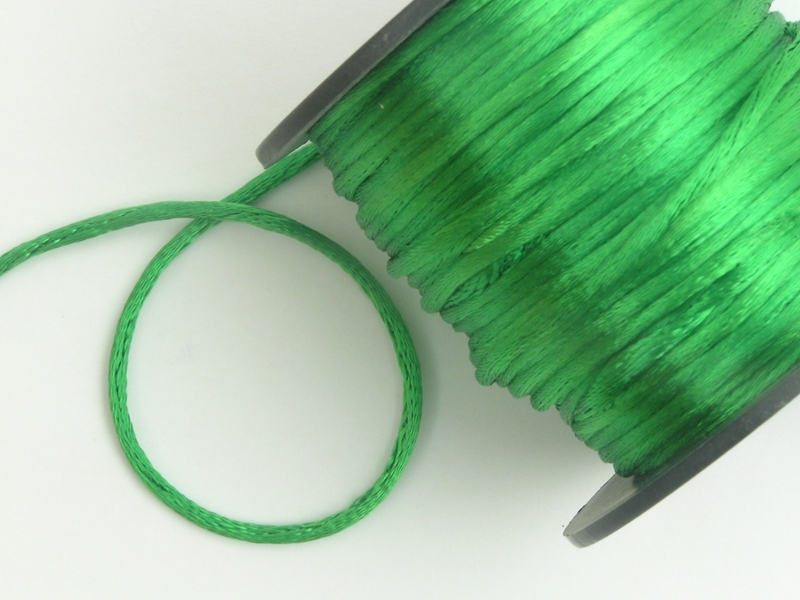 DESCRIPTION - Emerald Round Satin Cord, 1.5mm x 76 meters / 83.11 yards. 100% Polyester. DESCRIPTION - Fuchsia Round Satin Cord, 1.5mm x 76 meters / 83.11 yards. 100% Polyester. DESCRIPTION –9935 Fuchsia - Round Satin Cord, 1/16 x 50 Yards. 100% Polyester. DESCRIPTION - Gold Round Satin Cord, 1.5mm x 76 meters / 83.11 yards. 100% Polyester. DESCRIPTION - Hunter Green Round Satin Cord, 1.5mm x 76 meters / 83.11 yards. 100% Polyester. DESCRIPTION –9935 Hunter - Round Satin Cord, 1/16 x 50 Yards. 100% Polyester.